Apple has a very popular handset in the form of the iPhone 5 but Samsung is on course to become the world’s biggest smartphone manufacturer during 2013. Can the Galaxy Note compete with the iPhone when the features of each are compared? One of the most obvious differences is the weight of the phone. The iPhone weighs 112 g while the Samsung handset is much weightier at nearly 180g. The operating system for the Galaxy Note is Android and this is ideal for most users as it is very easy to navigate. Apple has its own operating system for its handsets and this is also easy to use. Choosing between them will come down to personal preference. The battery life on the Samsung handset is 570 hours of standby time which is quite impressive although it only gives 4 and a half hours of talk time, which will be disappointing for most users. The situation is reversed with the Apple iPhone 5. Standby time is 225 hours which is fairly low but there is talk time of up to 8 hours, making this a good choice for those who want to be on their handsets all day. The internal memory on the Samsung is an impressive 16GB and there is a microSD slot to increase this by a further 32 GB. The internal memory on the iPhone varies so you can opt for 16 GB, 32 GB or 64 GB. You do need to choose wisely though as there is no option to expand, so only go for the lower options if you are sure that you will not want to store a lot of music or photos. The 32GB and 64GB iPhone options come at a hefty premium, so don’t buy more than you need. The camera on the Samsung has 8 megapixels and all the extras that you would expect from a good quality camera including an in-built flash, front-facing camera for video calls that itself has 2 megapixels and the ability to take video footage. This is almost matched by the Apple iPhone 5, although the front-facing camera only has 1.3 megapixels. Connectivity options with the Samsung Galaxy Note include Bluetooth, 3G, Wi-Fi and NFC. The Apple iPHone has not been given NFC connectivity so if this is something that you are looking for you need to stick with the Samsung. Both of the handsets have a good quality screen and images are sharp, clear and bright. This makes surfing the net very easy and tasks such as emailing or texting are a doddle on both of the handsets. 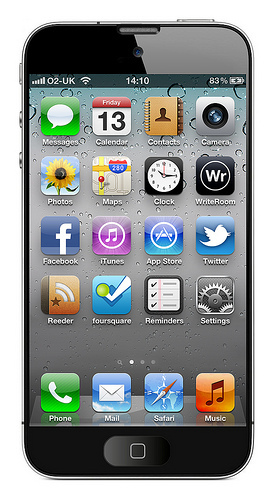 The Samsung’s screen makes the iPhone’s look tiny and web pages are much easier to read on its larger screen. It should be noted that neither of these phones is aimed at the budget market. Unless you can get a good deal on a contract phone you will find yourself paying out several hundred pounds and it is a good idea to familiarise yourself with the handset before you pay out for it. Both of these handsets is high-end and you do actually get what you pay for, so if you want something top of the range then there is no reason not to give either of these a try. Phil Turner has searched for iPhone 4s deals and has decided that he is not prepared to pay a premium just because it’s an Apple phone.